Firearms belonging to a World War II hero have been donated to The Gordon Highlanders Museum after they were found during a house clearance. 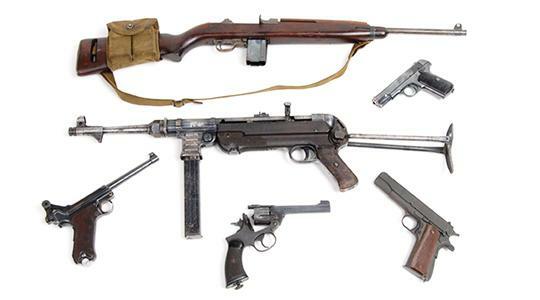 The six weapons, including a German 9mm Luger pistol, a .38 Enfield revolver and a .30 US carbine, were found in March 2008 when a woman reported to police that she had found them while clearing out a property in Walton-on-Thames, Surrey. They belonged to Geoffrey McLeod Hallowes, who was married to Resistance fighter Odette Sansom. Extensive enquiries at the Imperial War Museum led to the weapons being placed in The Gordon Highlanders Museum in Aberdeen as part of the Regimental history and heritage along with Mr Hallowes' war medals. Mr Hallowes served with the Gordon Highlanders and later became an SOE (Special Operations Executive) agent, helping to organise French resistance after D-Day as part of the Jedburgh fighters sent to sabotage German reinforcements rushing to Normandy to thwart the Allies. Prior to that he had evaded capture by the Japanese after the fall of Singapore in 1942. His bravery during the war was recognised by a number of gallantry awards, including the Croix de Guerre and Légion d'honneur. Mr Hallowes died in 2006. He was married to French Resistance fighter and George Cross winner Odette Sansom who died in 1995. The couple married in 1956. Ms Sansom was captured by the Germans in 1943 in France while undercover and tortured by the Gestapo but never gave her comrades away. She spent the rest of the war in Ravensbruck Concentration Camp and was the first woman to receive the George Cross for her courage during the World War II. She became a national hero, especially after the release of the film in 1950 about her wartime exploits called Odette, starring Anna Neagle. Curator of The Gordon Highlanders Museum, Jesper Ericsson said: "The acquisition of these firearms is the most important addition to the Museum's Armoury since it opened in 2007 and will become the most important items in the firearms collection as a whole. "This is because not only can we connect these firearms with an individual, but an individual with an extraordinary history. We are most grateful to Surrey Police for their generous help and support in facilitating this donation." Surrey police spokesman Roger Weedon said: "We were delighted to be able to identify the context of the use of these firearms and were able to arrange for their lawful transfer to a museum where they will be retained for the benefit of future generations."